In 2017, Tower Grove Neighborhoods Community Development Corporation (TGNCDC) worked with SLU Clinic and Rise to produce “A Guide to Understanding and Addressing Vacancy in the St. Louis (http://www.risestl.org/what-we-do/public-documents/vacancy-guide/)." In the guide, we highlighted available but minimally used state nuisance statute lawsuits that pressure owners to sell or improve long vacant properties based on the negative impact they have on neighborhoods. This community development tool, in partnership with STL City building division efforts, acts as a motivating factor to stimulate action. TGNCDC has always combated vacant properties through block by block inventories, working with the City, infusing public art, contacting/working with owners and facilitating development. 3451-53 S. Grand is one highly visible vacant property that gained unwanted notoriety because someone died in the rear, unsecured garage 2 years ago (https://www.stltoday.com/news/local/metro/a-mass-killer-st-louis-heroin-deaths-hit-new-high/article_2fd6130c-3c35-524a-891e-e51eff2e40b4.html). This situation and calls from neighbors moved the property to the top of our list. After months of letters and attempting to work with the owners, our board and staff reached out to neighbors surrounding the 3451-53 S. Grand property and met with them about options. Through some community engagement and after the owner failed to address the concerns himself, a nuisance lawsuit was filed by @StinsonLeonard, pro-bono (THANK YOU), against the owner with the Julie Scheipeter leading the legal work. The lawsuit, we believe, caused the owner to sell to another investor, Andrew Yee. Andrew wasn't aware of the lawsuit but communicated through the process and began to make exterior improvements to meet building codes and suggested repairs. St Louis City building division inspected the property multiple times and was a partner in the process. In the end, new windows, new tuck-pointing, new garage roof, new gutters, new fence panels, and securing the property were completed. Andrew also started a regular trash pick up program around the property. 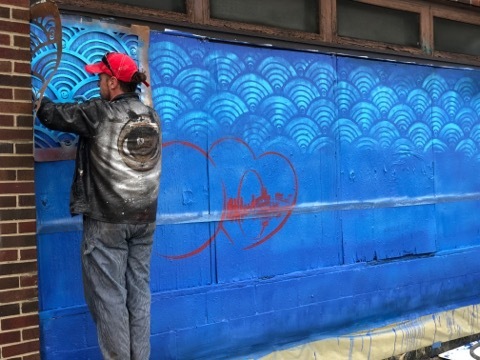 To top it off, TGNCDC, in partnership with Andrew, hired artist Peat Eyez (@stenSOUL) to beautify the front of the building with a stunningly colorful mural. Andrew and TGNCDC are working on his redevelopment plans for the building. We believe it will take a few years to get the property renovated and occupied. We hope the successful neighborhood improvement project example at 3451-53 S. Grand helps other CDCs and community organizations use the tools to help other areas in St. Louis. Nuisance lawsuits assist in making it more difficult to hold vacant properties and perform outside the lenient St. Louis City vacant property policies. Public art adds interest to buildings and undeserved areas and working with owners only helps build bridges for more positive work at other sites. Our work promotes working together as a community, using the all available options, and a day after day commitment to see vacant property enhanced/redeveloped for our one of a kind STL City neighborhoods.